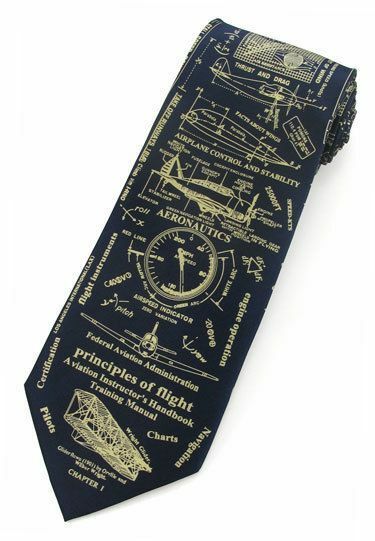 The Principles of Flight aviation neck tie is a great gift for a pilot or airplane enthusiast. This quality tie is made with silk, and has an inner lining. The dark blue background highlights the principles of flight. Nancy’s Notes: At Tailwinds we love merchandise that has an aviation theme, and also has a historical perspective on the early days of flight. Here the neck tie images were reprinted from actual drawings of an early day flight manual. In this case, the manual was titled Aviation Instructor’s Handbook Training Manual. Of course, the principles of flight have not changed, but the historical images add a fascinating perception. Due to the novel design of the neck tie I also think that this tie is a good conversation starter!